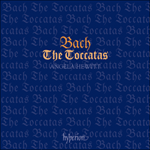 The Toccata in F sharp minor, BWV910 is the least well-known of the seven. It’s written in an unusual key for Bach’s time, and contains two fugues, quite different in character. After the ‘warming up’ section of scales and descending figures (which would certainly not be out of place on the organ), we come to a noble adagio that is very chromatic, the subject of which will reappear in the final fugue in a different guise. The rhythm is that of a sarabande. 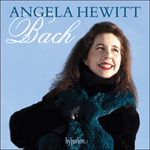 Bach’s embellishments seem only to be a start, and the performer can certainly add more here according to his taste. The first of the fugues is marked ‘Presto e staccato’ and its pointed subject no more than a descending scale with a short cadential trill attached. The semiquavers around it add brilliance. There is some rhythmic interest in a hemiola passage which suddenly sounds as though the time signature has switched from four to three beats in the bar. Following that, we have a rather startling section in which the same arpeggiando figure is stated 21 times in a strange series of harmonic progressions, a procedure we also find in the D minor toccata. This leads us to the final fugue in 6/8 time, where the chromatic theme of the adagio is livened up, but made to be no less expressive. Wanda Landowska writes of the toccatas as being ‘incoherent and disparate’ at first sight, mentioning this toccata as an example of that. The difficulty is in finding their shape. She goes on to say: ‘What strikes us above all is the unrelenting insistence with which Bach holds on to a motive, repeating it indefatigably on every step of the scale.’ That is certainly true, though the writing, as shown in this toccata, is nevertheless impassioned. La Toccata en fa dièse mineur, BWV910 est la moins connue des sept. Elle est écrite dans une tonalité inhabituelle pour l’époque de Bach, et contient deux fugues de caractère différent. Après la section « d’échauffement » de gammes et de motifs descendants (qui ne seraient certainement pas déplacés à l’orgue), nous arrivons à un noble adagio très chromatique, dont le thème sera repris dans la fugue finale sous un aspect différent. Le rythme est celui d’une sarabande. L’ornementation de Bach ne semble être qu’un début, et l’interprète est certainement à même d’en ajouter selon son goût. Notée « Presto e staccato », la première des fugues dévoile un sujet en rythmes pointés qui n’est autre qu’une simple gamme descendante dotée d’un trille cadentiel concis. Les doubles croches qui l’entourent ajoutent un brio scintillant. Un intérêt rythmique certain se fait jour dans un passage en hémiole qui donne soudainement l’impression que la mesure s’est transformée de quatre à trois temps par mesure. Apparaît ensuite une section plutôt étonnante où le même motif arpeggiando est énoncé à 21 reprises dans une étrange série de marches harmoniques, un procédé que l’on retrouve également dans la Toccata en ré mineur. Ceci nous mène à la fugue finale à 6/8 où le sujet chromatique de l’adagio est animé sans pour autant perdre de son expressivité. Wanda Landowska écrit à propos des toccatas qu’il s’agit des œuvres « incohérentes et disparates » à première vue, prenant cette toccata en exemple. La difficulté réside dans la définition de sa coupe. Elle ajoute, « ce qui nous étonne par-dessus tout, est l’insistance sous-jacente avec laquelle Bach tient à ce motif, le répétant sans faiblir à chaque étape de la gamme ». C’est certainement vrai, même si l’écriture, comme dans cette toccata, est néanmoins passionnée. Die Toccata in fis-Moll, BWV910 ist die unbekannteste der sieben. Das Stück steht in einer für Bachs Zeit ungewöhnlichen Tonart und umfasst zwei Fugen sehr unterschiedlichen Charakters. Nach dem „Einspiel“-Teil mit Tonleitern und absteigenden Figuren (die sicherlich für die Orgel nicht unpassend wären) kommt ein nobles, sehr chromatisches Adagio, dessen Thema in der Schlussfuge in etwas anderer Gestalt wiederkehrt. Der Rhythmus ist der einer Sarabande. Bachs Verzierungen scheinen hier lediglich einen Ausgangspunkt darzustellen, die der Ausführende sicherlich je nach Geschmack ergänzen kann. Die erste der beiden Fugen ist mit „Presto e staccato“ überschrieben und das spitze Thema ist nicht mehr als eine absteigende Tonleiter mit einem kurzen Kadenztriller. Die Sechzehntelnoten sorgen hierbei für Brillanz. Rhythmisch interessant ist eine Hemiolenstelle, bei der es sich plötzlich so anhört, als ob der Vierertakt zu einem Dreiertakt geworden sei. Danach kommt eine recht überraschende Passage, in der dieselbe arpeggiando-Figur 21 Mal in seltsamen harmonischen Fortschreitungen vorkommt. Dasselbe Verfahren ist in der d-Moll Toccata zu finden. Nun folgt die Schlussfuge, die im 6/8-Takt steht und das chromatische Thema des Adagio aufnimmt, es jedoch nicht weniger expressiv erscheinen lässt. Wanda Landowska schreibt, dass die Toccaten auf den ersten Blick „unzusammenhängend und disparat“ seien und nennt diese Toccata als Beispiel dafür. Die Schwierigkeit liegt darin, die jeweilige Gestalt zu bestimmen. Weiter sagt sie: „Am meisten verblüfft uns das unablässige Insistieren, mit dem Bach auf einem Motiv beharrt, das er dann unermüdlich auf jeder Tonstufe wiederholt“. Diese Beobachtung ist sicherlich richtig, obwohl der Kompositionsstil, der in eben dieser Toccata zum Ausdruck kommt, trotzdem leidenschaftlich ist.